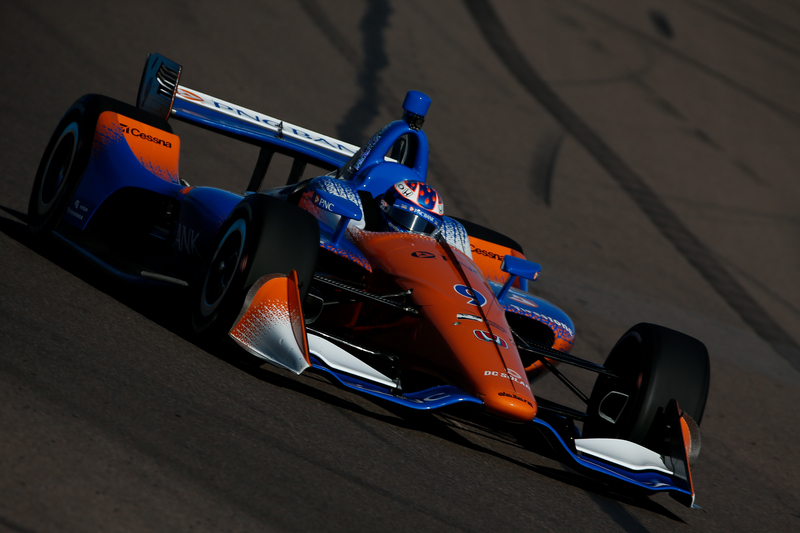 After a full day of IndyCar testing from ISM Raceway in Avondale, Arizona, there were a slew of various reactions up and down the pit lane. The implementation of a new universal aero kit on the Dallara IR-12 chassis currently being used in IndyCar competition has received rave reviews after testing the car at road courses such as Sebring International Raceway and Sonoma Raceway. This was the first time that the full field of IndyCar teams had gotten the opportunity to put the UAK through its paces on a short oval – and there were certainly some growing pains. While Dale Coyne Racing has been building momentum with various announcements made over the past two weeks, it was a challenging day for their four-time Champ Car World Series champion, Sebastien Bourdais, on Friday. 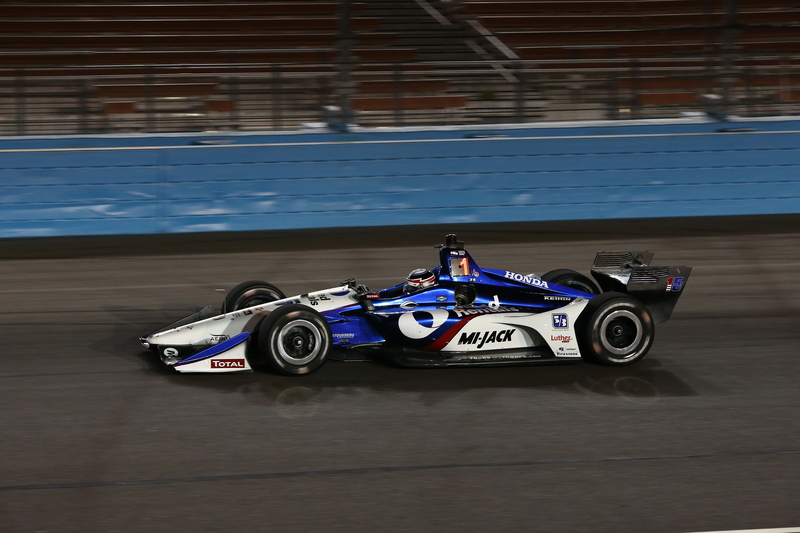 Much happier with their results, the Rahal Letterman Lanigan Racing duo of Graham Rahal and Takuma Sato finished each of the two practice sessions in the top six on one-lap speeds, and recorded a 1-2 finish to the final session on Friday evening. Emerging from under the previous Honda aero kit and its deficiencies on short ovals, Rahal had nothing but positive words after a day of running. Graham Rahal had a quick day in his No. 15 United Rentals Honda, finishing in the top six of each practice session. Rahal and Sato were the only drivers to post a lap averaging 189 miles per hour on the 1.022-mile oval on day one, with times of 19.457 and 19.460 respectively. For Andretti Autosport rookie Zach Veach, it was his first opportunity to drive an IndyCar on a short oval. The 23-year-old driver has been trying to absorb all the information he possibly can – though even his team understands that there will be much to learn over the course of the 2018 season. “My engineer said it best when he said I’m retaining about 60% of the information right now,” laughed Veach. “It’s like drinking from a fire hose. 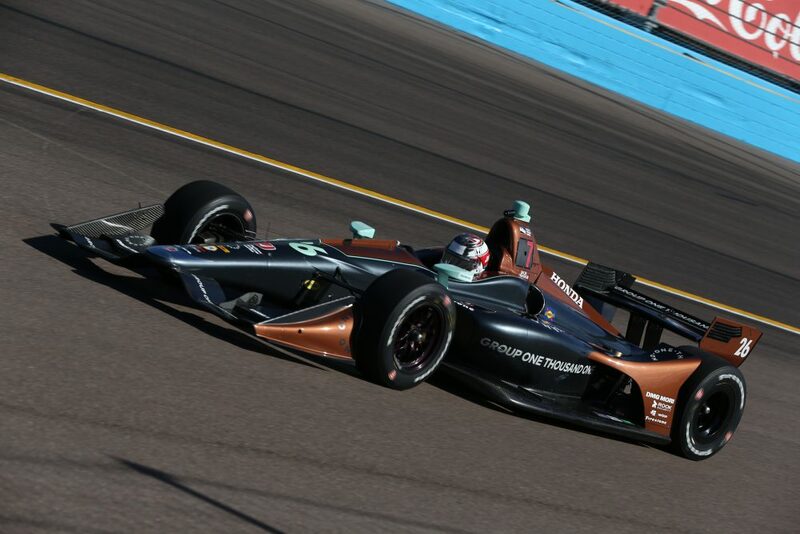 The former Advance Auto Parts INDYCAR Radio Network reporter did have some useful insight to add following a day’s worth of practice at ISM Raceway. In describing the car, he utilized analysis from his three teammates to build his own baseline before taking to the track. After that, he could relate the car’s performance to his own previous experience. “The track is really fast and my teammates have told me the car is quite a bit lighter from last year’s,” Veach said. “It feels like the same amount of grip as an Indy Lights car, but we’re going 20 to 30 mph faster. We’ve had a great start to the test with the rookie test yesterday and the session this afternoon. Veach shouldn’t feel too bad knowing he doesn’t have as much in his notebook to pull from. Veterans like Scott Dixon and James Hinchcliffe have come to the realization that there aren’t too many characteristics of previous setups that will translate to this new universal aero kit. Even the four-time champion, Scott Dixon, was left starting from scratch with the new universal aero kit on Friday. “There are a lot of unknowns here with the new car to be honest. We are trying to do a lot of things and go through a lot of changes to understand this car,” Dixon, a four-time champion, explained. For Hinchcliffe, it was somewhat of a surprise that teams will be able to utilize so little of the information that they had compiled in previous seasons driving the Dallara IR-12 chassis. “I don’t really know what we expected (from Friday), obviously everything is so new,” said Hinchcliffe. “It’s funny how for the same fundamental car – the chassis is the same, the suspension’s all the same, all the rest of it – how much just a change in the bodywork can affect the setups, what you need to do, and what the car likes, how it behaves. Keep visiting Open-Wheels.com for the latest from the 2018 INDYCAR Prix View from ISM Raceway as the Verizon IndyCar Series prepares for the 2018 championship.